By tanknovice, February 8 in !! 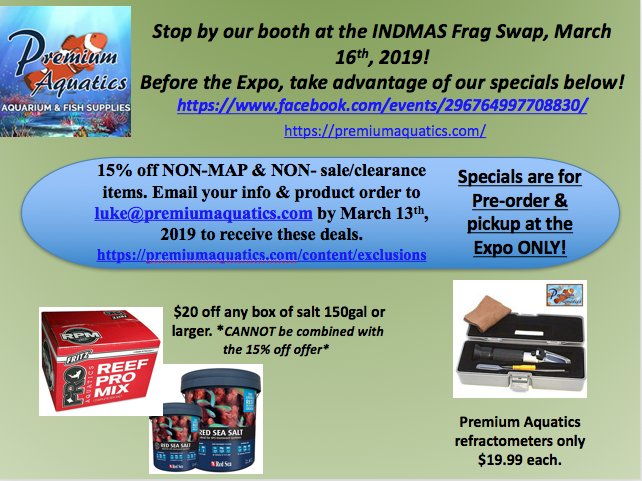 !FRAG SWAP 2019!!! No coupon just call in to Luke at 317.895.9005 and we will bring it to the swap for ya! Last time we set up a coupon for this, people from out of state were using coupon and throwing our shipping system off. Brandon how long you offering the discount for. Do we call and pay over the phone to order what we want? Yeah just give luke a call. We will have the refractometer and RODI sets at the swap. The salt is a preorder deal only. We wont be taking salt to the swap. However every Saturday we are open we have that salt special for pickup only. Great deal...you must ask for it at the register. Not valid on already marked down salts or busted bags etc. Come down and see us this weekend 2/16 we are open 12p to 3p!